Employee engagement refers to the degree to which an individual feels a passion for and commitment to his or her workplace. This is important because an engaged workforce is the difference between an organisation which keeps itself afloat and one which thrives. 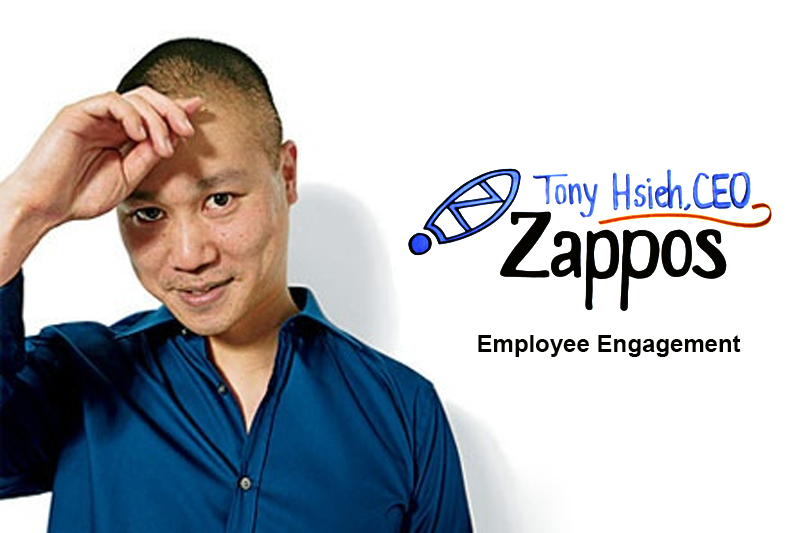 One company with a solid understanding of employee engagement is Zappos, a successful online retailer. But before we look at Zappos, let’s take a closer look at the different types of employee engagement. 1. An engaged employee feels passionate about and connected to the company for which they work. They are happy to bring their innovation and skills to move the company into the future. 2. An employee who is disengaged will only complete the minimum amount of work and they will not display ‘discretionary effort’. That is, they will not put in any additional time or effort above what is expected. They merely show up, and lack the motivation and enthusiasm of an engaged employee. 3. An employee who is actively disengaged is more than unhappy or unmotivated. This is displayed through behaviour such as completing less work than required, or creating difficulties for fellow employees. Knowing the distinctions between levels of employee engagement is a great start, but how can that knowledge be put into practice? · Zollars are a form of internal currency that Zappos employees receive for volunteering to help with different tasks, taking part in training or answering questions. These company dollars can then be redeemed for exclusive Zappos merchandise, a donation to charity or movie tickets. · The Co-worker Bonus Program involves co-workers rewarding each other with a $50 bonus. A bonus can be given once a month by each employee but there is no limit to how many bonuses an employee can receive, providing those bonuses are given by different employees. · The HERO Award operates alongside the Co-Worker Bonus Program. The HERO Award is given to someone who wholly embodies the core values of the company, and employees are nominated when they receive a co-worker bonus. · Master of WOW Parking refers to an ideal parking spot being given to an employee for one week after they were nominated for the reward by a co-worker. These peer-driven incentives are part of Zappos’ shift from a hierarchical organisation to one based on Holacracy. In other words, they are creating a system which strives to provide employees with more power and control over their work. This is a smart move, as the Ivey Business Journal noted that giving employees a sense of control was one of the 10 most effective means of fostering employee engagement. The “10 C’s of Employee Engagement” outlined by the Ivey Business Journal are evidently an integral part of Zappos, but they could be adopted by any organisation to the same effect. The 10 C’s can be simplified into two categories: the types of tasks employers can assign their employees and how and what they communicate with employees. · Assign employees tasks that give them a sense of control or autonomy. For example, consulting with individual employees about areas in which they may want to improve or extend themselves can prove a good way to do this. · The personalities of different team members – if all team members are dominant and seek a leadership position, they are unlikely to successfully co-operate. Conversely, if all team members are passive and quiet, they may co-operate but struggle to make decisions. This highlights the importance for some diversity even in small teams to ensure optimal performance. · Congratulate employees on their effort/a job well done in a variety of ways. This includes but is not restricted to verbal praise and/or financial rewards. · Ensure that employees know they are making a meaningful contribution to the organisation by providing information and feedback in relation to the company performance and their own. · Employers should explicitly convey their expectations of employees to avoid miscommunication. · Provide employees opportunities for career advancement. · Managers can give their employees a clear vision of the goals of the organisation. · Beyond this, they should also provide specific and achievable goals at an individual or department level. Zappos is particularly explicit in its desire to deliver a “WOW” service to its customers and staff. This is well recognised, as Zappos ranked #6 on Fortune Magazine’s “100 Best Companies to Work For” in 2011. So why should an organisation strive to have its employees engaged as much as possible? In a nutshell: engaged workers are productive workers, and they create a well-functioning organisation. The benefits of employee engagement are not restricted to the employees themselves. They have a significant impact on the overall reputation and performance of the company, as the Zappos example clearly displays. Zappos treats its workers like human beings, not just numbers or cogs in the Zappos machine, and the results are undeniable. The lesson is clear: If you want employees who are engaged within their company, make sure that you are engaged with them first.